Polestar, 45th floor, Keio Plaza Hotel Tokyo, 2-2-1 Nishi-Shinjuku, Shinjuku-Ku, Tokyo 160-8330. +81 3 3344 0111. Mon to Fri 5pm-11.30pm (Last order 11pm). Sat, Sun & Holidays 3pm-11.30pm (Last order 11pm). View and Dining the Sky Revolving Restaurant, 17th floor, The Hotel New Otani, 4-1 Kioi-Cho, Chiyoda-Ku, Tokyo 102-8578. +81 3 3238 0028. 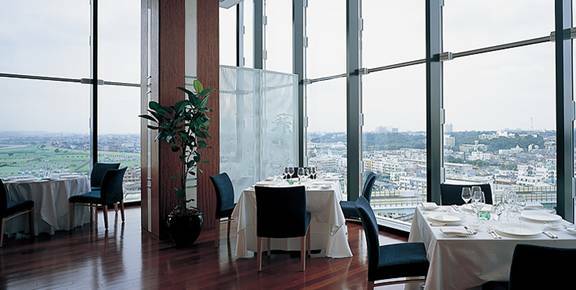 Revolving restaurant with a 360 degree view offers great vantage points for a breathtaking panorama. Weekdays: Lunch 11.30am-2pm. Dinner 5.30pm-9pm. Sat & Sun times vary. Top of the Tower Restaurant, 40th-floor, The Hotel New Otani, 4-1 Kioi-Cho, Chiyoda-Ku, Tokyo 102-8578. +81 3 3238 0023. 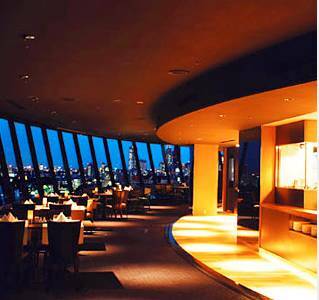 Restaurant that features panoramic views of the Tokyo metropolis. 360 Degree View of Tokyo. Top of the Tower offers a breathtaking view of Tokyo, by day or by night. Western. Smoking is prohibited during breakfast hours. Nadaman, The Hotel New Otani, 4-1 Kioi-Cho, Chiyoda-Ku, Tokyo 102-8578.+81 3-3265 7591 NADAMAN boasts a generous view of the Japanese Garden and offers new recipes on a monthly basis, each reflecting the changing seasons of the year. Bella Vista, The Hotel New Otani, 4-1 Kioi-Cho, Chiyoda-Ku, Tokyo 102-8578. 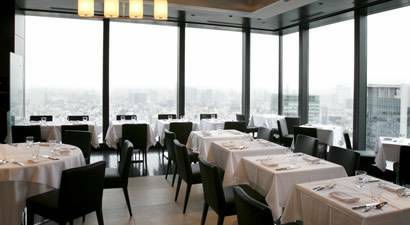 +81 3 3238 0020 The main dining restaurant, BELLA VISTA, offers a magnificent view of Tokyo from the top floor of the Garden Tower. Age over 13 years only. Lunch 11.30pm-2pm. Dinner 5.30pm-9pm. The Bar, 40th-floor, The Hotel New Otani, 4-1 Kioi-Cho, Chiyoda-Ku, Tokyo 102-8578. +81 3 3265 1111. Features a spectacular view of the symbolic Tokyo Tower, standing in the center of Akasaka city. With a well appointed interior, this cozy bar is a perfect place for a leisurely drink before or after dinner. Light meals are also served. 5pm-12 midnight. Breeze of Tokyo, 36th Floor, Marunouchi Building, Marunouchi, Chiyoda-ku, Tokyo +81 3 5220 5551. Near the JR Tokyo Station. You can get a wonderful view of Tokyo since most of the tables are by the windows. It's best to go at night time. Be careful when you ask for directions since there is a Maru Building & a New Maru Building. Mon to Sun or Holiday Lunch: 11am - (Last Orders 2.30pm), Cafe: Mon to Sun or Holiday 3pm - (L.O. 4.30pm). BAR: Mon to Sun or Holiday 6pm on. DINNER: Mon to Sat 6pm-12 midnight (L.O. 10pm), Sun and Holidays 6pm-11pm (L.O. 9pm). Antica Osteria del Ponte, 36th floor, 2-4-1 Marunouchi Chiyoda-ku, Tokyo, Japan. +81 3 5220 4686. Shofuku-ro, 36th floor, 2-4-1 Marunouchi Chiyoda-ku, Tokyo, Japan. +81 3 3240 0003. The Ginza Revolving Sky Lounge, 15th floor, 10-1 Tokyo Kotsu Kaikan Bldg, Yuraku-cho 2-chome, Chiyoda-ku, Tokyo 100-0006. +81 3 3212 2775. Chinese themed restaurant atop the Hyundai Department store in Cheonho, Tokyo. Rotates counterclockwise unlike most revolving restaurants. AWkitchen Tokyo, 5th floor, 1-5-1 Marunouchi Chiyoda-ku, Tokyo, Japan. +81 3 5224 8071. Ekki Bar & Grill, 7th floor, 1-11-1 Marunouchi Chiyoda-ku, Tokyo, Japan. +81 3 5222 5810. Panorama Lounge, 21st floor, Hotel East 21 Tokyo, 6-3-3 Toyo, Koto-ku, East Tokyo 1350016. +81 3 5683 5683. 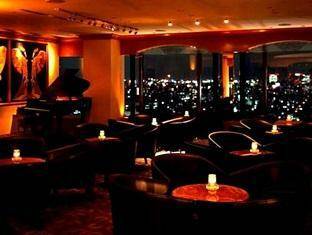 With great views of the city, Panorama is a relaxing cocktail lounge that offers live music in a congenial atmosphere. Weekdays 5pm-1am. Sun 5pm-12 midnight. The hotel features the view of newly-developed Odaiba in the distance while the fragrance of old Edo culture remains at hand. Kiba Teppanyaki, 21st floor, Hotel East 21 Tokyo, 6-3-3 Toyo, Koto-ku, East Tokyo 1350016. +81 3 5683 5683. 5.30pm-9.30pm. Sazanka Japanese Restaurant, 21st floor, Hotel East 21 Tokyo, 6-3-3 Toyo, Koto-ku, East Tokyo 1350016. +81 3 5683 5683. Lunch 11.30am-2.30pm. Dinner 5.30pm-9pm. Mochizuki Restaurant, 21st Floor, Asahi Beer Building, Asumabashi Sumida-Ku, Tokyo Asakusa, Tokyo 1040061. +81 3 5608 5002. Spacious views of the Asakusa-Sumida area. Mon to Fri 11.30am-3pm. 5pm-10pm. Sat, Sun & Holidays 11.30am-3.30pm. 5pm-9pm. Tokyo Metro Asakusa Station 3 minute walk. Tobu Isesaki Line Asakusa Station 5 minute walk. Sense, 37th floor, Mandarin Oriental Tokyo, 2-1-1 Nihonbashi Muromachi, Chuo-ku, Tokyo, 103-8328. +81 3 3270 8188. Open daily 11.30am-2.30pm. 5.30pm-10pm. Cantonese dining with views towards the East of the city. +81 120-806-823. Signature, 37th floor, Mandarin Oriental Tokyo, 2-1-1 Nihonbashi Muromachi, Chuo-ku, Tokyo, 103-8328. +81 3 3270 8188. Lunch 11.30am–2.30pm. Dinner 5.30pm–10pm. French-inspired cuisine. K'shiki, 38th floor, 2-1-1 Nihonbashi - Muromachi, Chuo-ku, Tokyo, Japan. +81 120-806 823. Dazzle, 8 and 9th floors, 2-4-12 Ginza Chuo-ku, Tokyo, Japan. +81 3 5159 0991. Ginza. Il Ristorante, 9th and 10th floors, 2-7-12 Ginza Chuo-ku, Tokyo, Japan. +81 3 6362 0555. Ginza. Argento Aso, 8th and 9th floors, ZOE Ginza Building, 3-3-1 Ginza Chuo-ku, Tokyo, Japan 1040061. +81 3 5524 1270. 11.30am-3.30pm. LO 1.30pm. Closed Wednesday. Views. Beige Tokyo, 10th Floor, Ginza Chanel Building, 3-5-3 Ginza, Chuo-ku, Tokyo 1040061. +81 3 5159 5500. This Alain Ducasse restaurant is as chic as French eateries get in Tokyo. Hotel New Tsukamoto Revolving Restaurant, 7-1 Chiba-Minato, Chuo-Ku, Narita Airport, Chiba, Tokyo, Japan 260-0026. D-lounge Cocktail Bar, 9th floor, Island Creation Tower, 1-22-12 Dougen-zaka, Shibuya-ku, Tokyo. +81 3 3770 0008. Roof top view Although this hip rooftop bar serves a lot of beer, it's very different from a beer garden in terms of ambience. The very urban view is from the top of a nine-story building at the edge of Dogenzaka, looking out over the rooftops of Shibuya. In addition to beers from around the world they also offer a good selection of cocktails and limited food. La Rochelle, 32nd floor, Shibuya Cross Tower, 2-15-1 Shibuya, Shibuya-ku, Tokyo, Japan. +81 3 3400 8220. Note: Ask for Pishkar-san who speaks English. The vew from a window table is magnificent on this 32nd floor. Lunch 12 noon-2pm+. Dinner 6pm-8.30pm. LO. Bar & Lounge 5pm-11pm. Closed Mondays (except Holidays). Bellovisto Bar, 40th floor, Cerulean Tower Hotel, 26-1 Sakuragaoka-cho, Shibuya, Tokyo 150-8512. Spectacular panoramic views of Tokyo including Shinjuku skyline. Restaurant Coucagno, 40th floor, Cerulean Tower Hotel, 26-1 Sakuragaoka-cho, Shibuya, Tokyo 150-8512. Magnificent view of Ebisu and Yokohama skyline. Lunch 11.30am-2pm (last order). Dinner 5.30pm-10pm (last order). Wired Cafe 360, 5th floor, 4-32-16 Jingumae, above KDDI Designing Studio 5F, Harajuku, Shibuya-ku, Tokyo. +81 5413 2630. Daily 10am-7.30pm. (LO). Internet. Nice panoramic views overlooking Harajuku. +81 3 3402 2733. Ukai-tei, 5th floor, 5-10-1 Jingumae Shibuya-ku, Tokyo, Japan. +81 3 5467 5252. Terrace/Deck. Benoit, 10th floor, La Porte Aoyama, 5-51-8 Jingumae, Shibuya-ku, Tokyo. Daily 11.30am-2.30pm. 5.30pm-10pm (LO). Cuisines of Italy, Spain, North Africa and Greece. Establised by Alain Ducasse. Din Tai Fung, 12th floor, 5-24-2 Sendagaya Shibuya-ku, Tokyo, Japan. +81 3 5361 1381. Outdoor seating view. 10am-10pm. Closed on Wednesdays. Ristorante Aso, 29-3 Sarugakucho Shibuya-ku, Tokyo, Japan. +81 3 3770 3690. Patio view. Museum 1999, L'eau a la Bouche, 4-2-9 Shibuya Shibuya-ku, Tokyo, Japan. +81 3 3499 1999. Views. Manoir d'Inno, 4-1-13 Shibuya Shibuya-ku, Tokyo, Japan. +81 3 3406 0200. Views. The Lumine and Mylord department stores atop the south side of the JR station both have inexpensive restaurant arcades on their upper floors. Shunka Shuto, 53rd floor, Tokyo Opera City, Shinjuku, Tokyo. +81 3 5353 7111. (take the Keio New Line subway to Hatsudai station). Yebitsu, Top floor, Westin Tokyo, 1-4-1 Mita, Meguro, Tokyo 153-8580. +81 3 5423 7000. 11.30am–3pm. 5.30pm–9.30pm. Panoramic views of Mt Fuji by day and Tokyo's glittering city lights by night. Teppanyaki. Starwood. Victor's, 22nd floor, Westin Tokyo, 1-4-1 Mita, Meguro, Tokyo 153-8580. +81 3 5423 7000. 11.30am–2.30pm. 5.30pm–10pm. French. Starwood. 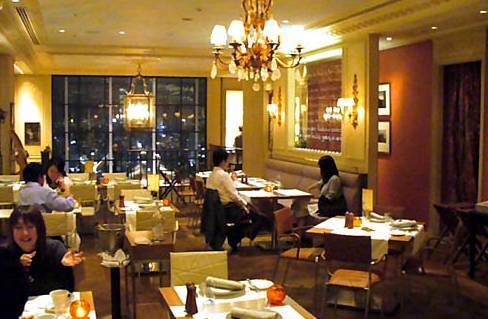 Westin Executive Club Lounge, 17th floor, Westin Tokyo, 1-4-1 Mita, Meguro, Tokyo 153-8580. +81 3 5423 7000. Starwood. 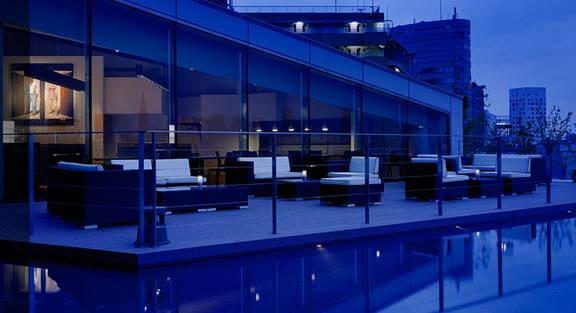 Compass Rose Sky Lounge, Top Floor, Westin Tokyo, 1-4-1 Mita, Meguro, Tokyo 153-8580. +81 3 5423 7000. 2pm-1am. Piano Bar. Starwood. Theme Restaurant, 43rd floor, Tokyo Dome Hotel, 1-3-61 koraku, Bunkyo-ku, Tokyo 112-8562. +81 3 5805 2111. Il Teatro, 3rd floor, 2-10-8 Sekiguchi Bunkyo-ku, Tokyo, Japan. +81 3 3943 6936. Views. Roku Nana, 3rd floor, Verde Roppongi, 7-16-11 Roppongi, Minato-ku, Tokyo, Japan; +81 3 6438 9915. China Blue, 28th floor, 1-9-1 Higashi-Shinbashi Minato-ku, Tokyo. +81 3 6388 8000. Tateru Yoshino Shiodome, 25th floor, 1-7-1 Higashi-Shinbashi, Minato-ku, Tokyo. +81 3 6252 1155. Waketokuyama, 3rd floor, Intercontinental, 1-16-2 Kaigan Minato-ku, Tokyo. +81 3 5404 2245. Daigo, 2nd floor, 2-3-1 Atago Minato-ku, Tokyo, Japan. +81 3 3431 0811. Good view. Hinoki-zaka, 45th floor, 9-7-1 Akasaka Minato-ku, Tokyo, Japan. +81 120 798 688. Roppongi. Napule, 1st floor, 9-7-4 Akasaka Minato-ku, Tokyo, Japan. +81 3 5413 0711. Roppongi terrace deck. Yama-no-Ue, 9-7-4 Akasaka Minato-ku, Tokyo, Japan. +81 3 5413 3577. Roppongi. 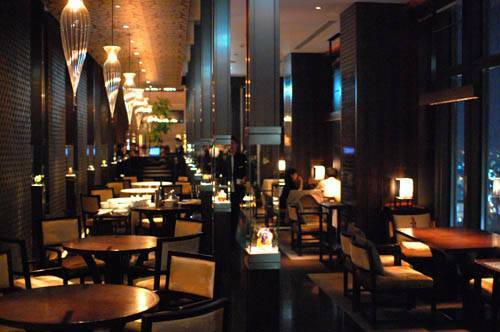 Mado Lounge Spice, 52nd floor, Mori Tower, is a cafe and bar. +81 3 3470 0052. Roppongi Hills. A bistro of a modern, casual style. Minato? Sky Restaurant 634, 1-1-2 Osiage, Sumida-ku, Tokyo. +81 3 3623 0634. Reservation only. Fantastic view of Tokyo. Terakoya, 3-33-32 Maeharacho Koganei-sh, Tokyo, Japan. +81 42 381 1101. Views. Ukai Toriyama, 3426 Minami-Asakawamachi, Hachioji-shi, Tokyo, Japan. +81 42 661 0739. Views. Le Train Blue Revolving Restaurant, Hiroshima Kokusai Hotel, Hiroshima, Japan. 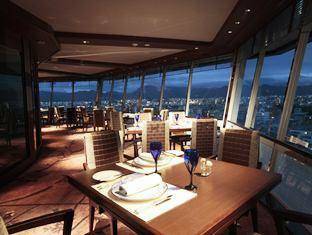 Restaurant Rondo Revolving Restaurant, Century Royal Hotel, Sapporo, Hokkaido, Japan. Fukunoseki Revolving restaurant, Shimonoseki, Japan (Hinoyama Summit) Karatocho, Shimonoseki, Yamaguchi Prefecture, Honshu, Japan. +81 83 234 2981. Hotel New Tsukamoto, Chiba Minato 7-1, Chuo Ku, Chiba, Japan 260-0026. Revolving. Rize, 6th Floor,Taiei Building, Asato 1-1-60, Naha-shi, Okinawa. +81 98 868 4770 Closed Mondays. 6pm-11.30pm.